This year’s Monitoring the Future Survey of drug use and attitudes among American 8th, 10th, and 12th graders continues to provide generally encouraging news, with many forms of drug use holding steady at low levels among the nation’s adolescents; however, concerns persist over the softening of attitudes around some types of drug use, particularly decreases in perceived harm and disapproval of marijuana use and perceived harm of non-medical use of prescription medications such as Vicodin, OxyContin and Adderall. Cigarette smoking continues to drop and is currently at its lowest rate in the survey’s history. One-year declines were seen in lifetime and past-month use among 10th graders, and all prevalence periods have seen a continued trend of decreasing cigarette use. For example, there were significant 5-year drops in lifetime, current (past-month), and daily cigarette use among all grades. 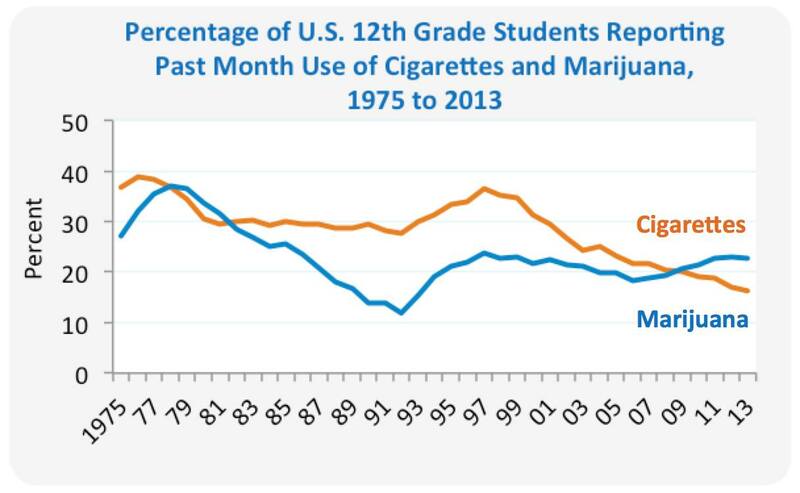 Current use was reported by 9.1% of 10th graders, down from 12.3% in 2008 and from 10.8% last year. 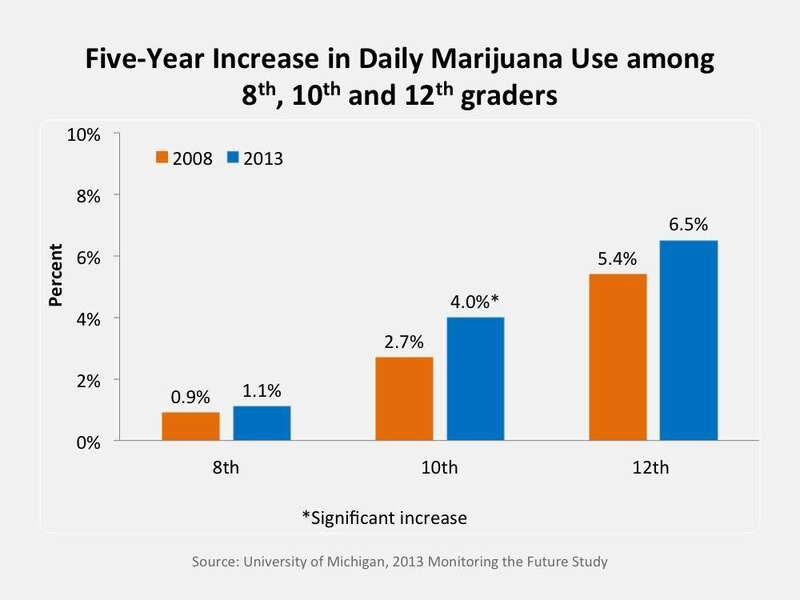 Eighth and 12th graders also saw a drop from 2008 to 2013, from 6.8 to 4.5% for 8th graders and from 20.4% to 16.3% for 12th graders reporting past-month use. 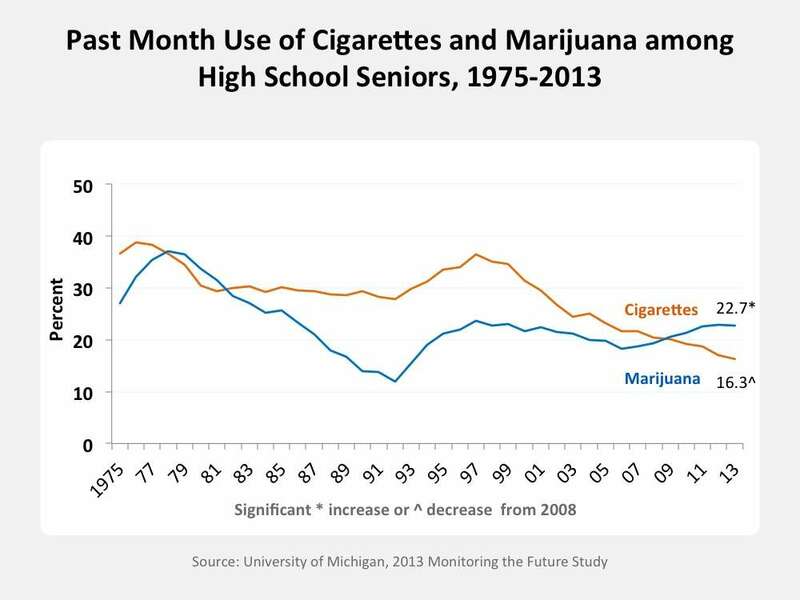 Although there were no increases between 2012 and 2013, it appears that marijuana use continues to exceed cigarette use in these students. 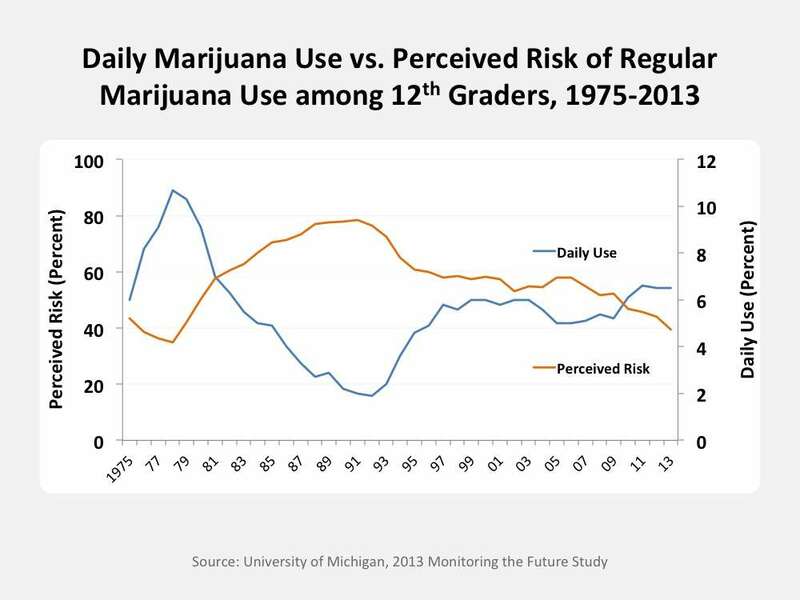 In 2013, 22.7% of high school seniors used marijuana in the past 30 days compared with 16.3% who smoked cigarettes. Likewise, 5-year trends continue to show significant decreases in alcohol use among all grades and across nearly all prevalence periods. For example, from 2008 to 2013, current use of alcohol declined from 15.9% to 10.2% among 8th graders, from 28.8% to 25.7% among 10th graders, and from 43.1% to 39.2% among 12th graders. From 2012 to 2013, decreases were observed in binge use of alcohol (defined as five or more drinks in a row in the last 2 weeks) among 10th graders, with a 5-year trend showing a significant decrease in all three grades. Overall, the use of most illicit drugs either remained steady or declined from 2012 to 2013. 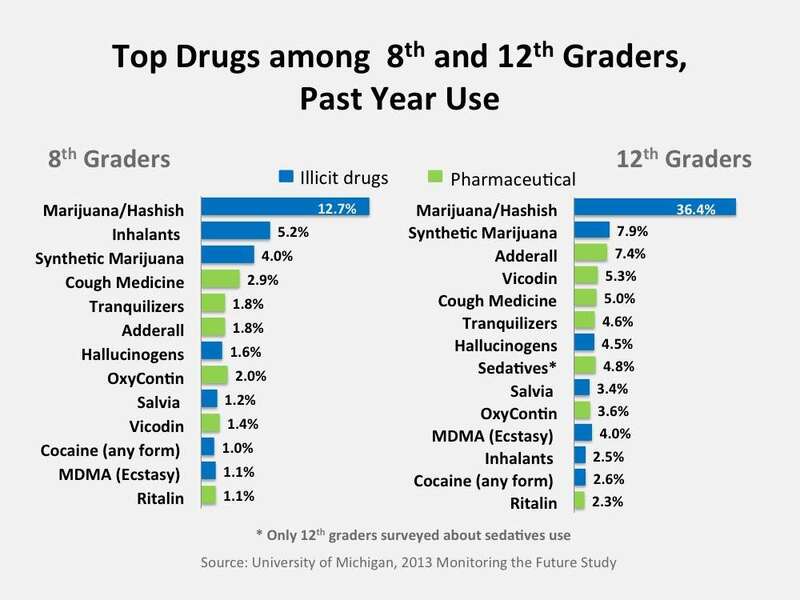 For instance, past-year use of synthetic marijuana (also known as K2 or “Spice”) among high school seniors sharply decreased, from 11.3% in 2012 to 7.9% in 2013. Another harmful synthetic drug, bath salts (synthetic stimulants), was added to the survey last year; perceived risk of harm of using bath salts increased substantially among 12th graders, with 59.5% now saying they think someone who tries bath salts once or twice risks harming themselves (physically or in other ways), as compared with 33.2% giving the same response the previous year. This year’s survey continues to show a long-term drop in past-year nonmedical use of prescription medications. Use of the pain reliever Vicodin has decreased among all grades; among high school seniors, it dropped from 7.5% in 2012 to 5.3% in 2013. OxyContin, another pain reliever, also showed a long-term drop in use among 12th graders, from 4.7% in 2008 to 3.6% in 2013. Lastly, use of inhalants is at its lowest levels in the history of the survey, among all grades and across nearly all prevalence periods. Among 8th graders, for whom inhalant use has always been most prevalent, past-year use dropped to an all-time low of 5.2% in 2013. 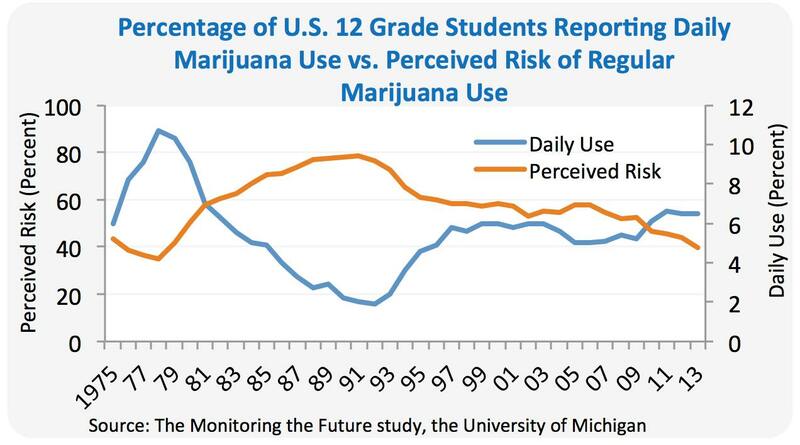 Five-year trends are showing significant increases in past-year and past-month (current) marijuana use across all three grades as well as increases in lifetime and daily marijuana use among 10th graders. From 2008 to 2013, past-month use increased from 5.8% to 7.0% among 8th graders, 13.8% to 18.0% among 10th graders, and from 19.4% to 22.7% among 12th graders. These increases continue to parallel softening attitudes about the perceived risk of harm and disapproval associated with marijuana use. Since 2010, the survey has captured the use of tobacco products other than cigarettes, such as use of hookahs to smoke tobacco, among high school seniors. Past-year hookah use has increased among 12th graders to 21.4%—the highest rate since 2010, when the survey started capturing this type of tobacco use. The increased abuse of prescription stimulants is also a cause for concern. The percentage of 12th graders reporting past-year nonmedical use of amphetamines rose from 6.8% in 2008 to 8.7% in 2013. 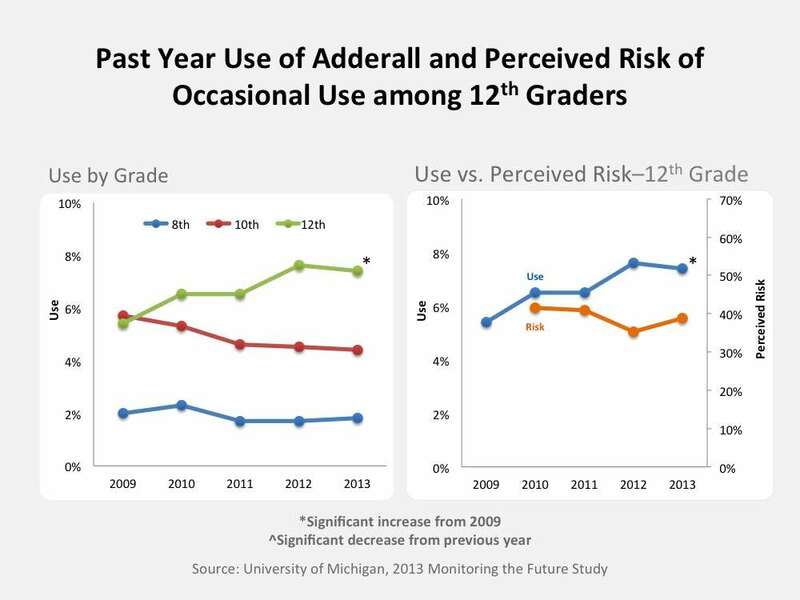 Current use among 12th graders also increased from 2.9% in 2008 to 4.1% in 2013. Changing attitudes toward substance abuse often precede changes in reported use. 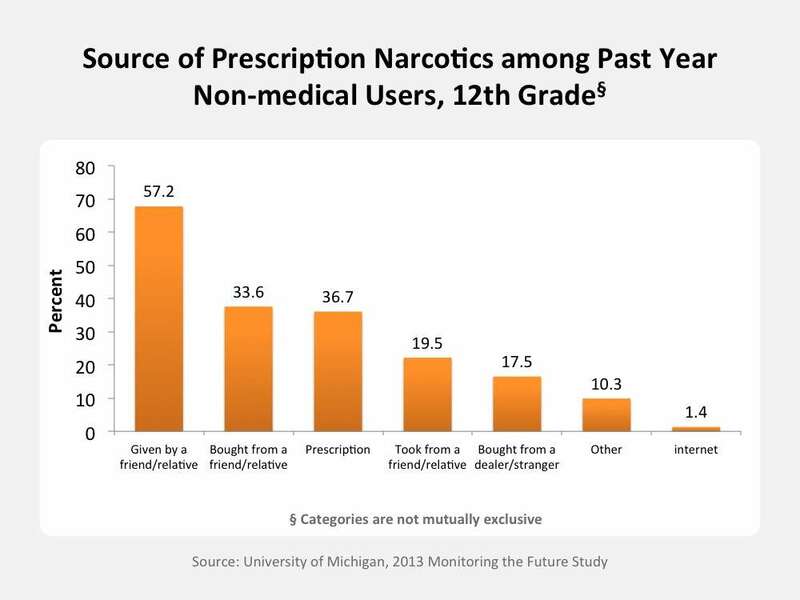 Although use of Vicodin has declined, so has perception of harm among teens. In 2013, perceived risk of harm of trying Vicodin occasionally declined in 8th graders, from 29.4% to 26.2% and 10th graders, from 40.3% to 36% in 2013. This could indicate that use could begin to rise again in future years.